In October I finished a 40-day programme that’s possibly been the greatest leap of faith outside my comfort zone – ever! It was based on A Course in Miracles, and the 40 days that Jesus went ‘out into the desert to be tempted by the devil’. I don’t know the Christian scriptures and I hadn’t read ACIM before, but essentially that story was about seeing the ego for the false self it really is (the devil) and trusting fully in Divine Spirit, regardless of the evidence in front of your eyes. The 40 day program allows you to see all the games the ego tries to play, you see your fears come up, you notice your grievances, judgements, justifications, arguments, your lack and limitations, hurts and resistance of the present moment. And you fully come to realise that it isn’t who YOU truly are. It’s about committing to have no plans, no ‘shoulds…’, to accept everything as it is, to not fix, force or try to change anything, to not criticise or condemn anything or anyone. It’s about seeing everything and everyone as love, and as an extension of yourself – releasing the illusion that you are separate from Source and the Power, Love and Infinite Abundance that is your birthright as a ‘Child of the Universe’. And fully trusting that, no matter what, you are Infinitely Supported and being guided. Many of the concepts and practices are similar to what I share in my Flow Alignment Intensive programme, and this time I felt really grateful and humbled to be on the receiving end. I did some totally mind-bending, un-businesslike things to jump fully into this, which stretched my faith literally beyond belief – beyond my old beliefs about reality anyway! I let go of forcing myself to do anything unless I felt the energy of inspiration. Whenever I felt a “I should be doing this or that business task” I stopped, because I could feel it coming from my head’s idea of how to run a proper business, and fear of not doing the right thing, or not following what the experts tell you to do. I honoured my body by walking on the nearby common every day, I ate what my body wanted when it wanted it, and I drank loads of water. I found myself napping in the daytime, I meditated for hours at a time if it felt right, I read and listened to a lot of information on higher consciousness, and I did daily energy clearing. Everything was focused on keeping my vibration high, which I really needed because I was experiencing a lot of detox symptoms like headaches, tiredness and mind fog. I could sense a kind of fight going on in me as the false self tried to maintain the control it still had. At times I questioned whether what I was doing was really higher guidance, and maybe it was all rubbish. And that I was stupid for being so reckless when I couldn’t afford it. But I tuned in to my Higher Self as much as possible to make sure my actions came from what felt aligned. I know that Higher Guidance feels expansive, light, loving, kind and empowering, and if the voice in my head didn’t make me feel like that I ignored it. And even though it was hard at times to ignore the panicky voice in my head because I wasn’t doing the usual things to market myself, and my bank balance was getting very low, I carried on. Eventually I got to the place where I would normally have been so stressed about the lack of money that I would have been having sleepless nights, I would have been racking my brains trying to DO something to change things around, and feeling like I only had myself to rely on to make it happen. I went past the point of no return – a leap into the void where my head had no answers for what I should do. And all I could do now was trust that Source would lift me and carry me safely to where I needed to be. And this time I didn’t go into fear. I stayed connected to love and felt total peace and trust that I was supported by the universe, that I was inherently abundant, safe and that things would work out. And I was sleeping like a baby! 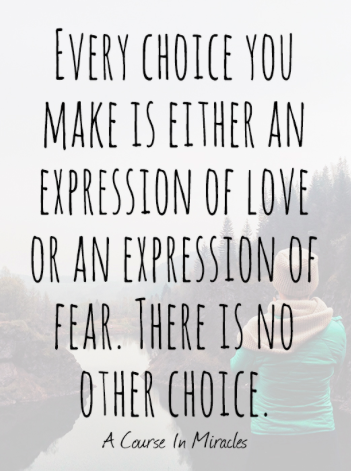 I began to consciously experience that fear was coming from the false, small, limited, mind-created self, and that while I gave it no attention and focused purely on feeling unconditional love, abundance and joy, eventually I came to a point where the fear lost its power. Well, I may have a few little wobbles from time to time as I slip back into lower-mind level thinking, but I’m catching it pretty quickly now, and I’m still feeling that freedom from fear. The integration is ongoing, but already I’m experiencing huge changes in my life. It’s been like opening a doorway into a new way of being. While observing myself and my mind objectively and maintaining a high vibration of joy, it took a few weeks of trusting that everything was going to be ok, but just when my bank balance was at its lowest, new and old clients started getting in touch to work with me, and my bank account started filling up again. It was quite bizarre to watch this unfold in such a detached way! Everything happens for a reason, and everything we go through, collectively or individually, comes from the Divine Intelligence of the Greater Consciousness of the Universe. There are no mistakes. Whatever unfolds is part of humanity’s and the planet’s evolution, so there is absolutely no point in fighting any of it. Life is abundant, it knows what it’s doing better than you and it will always support you. So you may as well allow everything to be as it is and surrender to the flow. And at the level of consciousness All is One and is ultimately rooted in unconditional love. So you have a choice. You can choose to identify with love, the energy of Source and who you truly are. 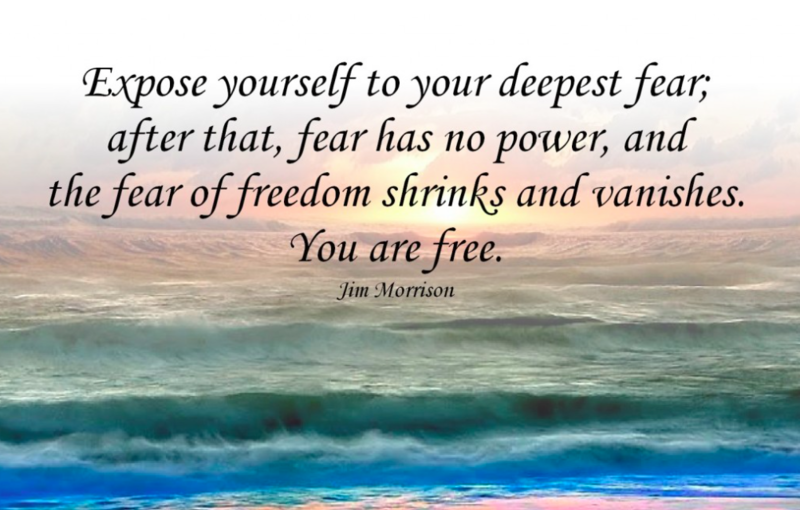 Or you can choose to let your false self stay in control and identify with fear, the force that keeps you believing you are small, trapped, powerless and separate from All That Is. Love, abundance, joy, connection, peace, freedom… and anything else you desire to experience is available to you now. There is no effort that you have to make to receive it, and nothing that you have to do to earn it or be worthy of it, because it is already who you are. You only need to tune into your unlimited Self and consciously choose it. If you’d like to have a chat about how I could help you move beyond fear to transform your current circumstances and create your aligned life from your true power then email me at connect@cathyballard.com and we can arrange a complimentary 30 minute call. Dear Cathy, thank you for sharing this, it will help me stay with choosing love, when I feel those wobbles coming up. Fabulous post Cathy. This is what has come to my mind – and would love to hear your thoughts on it. I think what you did was incredible – I don’t think I could do that – I would love to do the course in miracles and get connected deeper but I still want to work on my business. I love it and I’m so inspired by helping my clients – it really does give me a lot of joy and I find that I work in a higher vibration. If we are part of the planet’s evolution (which I believe we are) and part of the divine intelligence can we not still work on our business? I don’t force what I do – I just do what I do because I love it and it inspires me and the added bonus is the joy it gives me at helping my clients. I don’t find I am forcing myself or using up energy that leaves me deflated. Just wondered what your thoughts were on this. Hi Carole, that’s a great question. To be honest I couldn’t possibly guess what would happen if you did the 40 day programme or went deeper into A Course in Miracles. Each person is so unique and we’re all on our individual journeys. Mine happens to have always involved taking risks like this because life has given me the circumstances and compulsion to follow certain impulses. It’s part of my make up and my purpose to share what I find works, and guide others so they don’t have to take such leaps of faith. It seems to help people to let go more deeply and trust me because I can see and reflect back the truth of who they are, which helps them move through barriers much faster. Other people like yourself might have families or businesses where people and clients depend on them, and to do what I have done probably wouldn’t be right. But we all encounter the limitation and blocks that fear creates by listening to our mind-level thoughts – which appear very real. So now I can be their eyes when they’re stumbling in the dark, because I see the illusion more clearly and can help free them from it. In the same way you love your work in marketing, you’ve delved deeply into it and live for it because of the difference it makes for your clients, that’s what I get from doing the spiritual exploration and experimentation. We are both leading, and I know your own spiritual awareness and growth is now coming through what you do to support your clients in even greater ways, which is brilliant. So I think everyone finds what they need if they commit to following their inner guidance, stay as connected to Source as possible and maintain a high vibration. I doubt it’s possible to follow the complete 365 day Course in Miracles to the letter. It’s a huge task to undertake. The teacher of the 40 day program said she’d been doing it for 20 years and was still learning, so I would say that if you did it then you would get exactly what you need from it for where you are on your path right now. It’s not going to be for everyone, and you will come to it when the time’s right. I heard about it over 20 years ago and because of the Biblical language I was totally put off. But not long ago I was asking for a new spiritual teacher to guide me to the next level on my journey, and a few days later this short video-based course plopped into my inbox via a friend and I realised that this was what I’d been asking for! Carole, you are very intuitive, so just carry on doing what you’re doing until you feel the call to make a change. Trust yourself and your own inner guidance. It won’t let you down. Fabulous post Cathy and I have been doing something similar . Cannot wait to see the abundance unfold now but just as importantly am loving being in place of peace and trust ! Thanks for commenting Lucy. I hope the peace and trust continues. It can’t help to unfold if you maintain your vibration like that. You’re just in the time lag, so just keep feeling yourself as already abundant and it will soon show up. Thank you for sharing your journey of choosing love.. I can how it required your total dedication and perseverance. This is a good reminder for what is currently happening around us and how we can continue to raise our vibrations and choose love.